The Australian takeover in cineplexes worldwide continues. With more and more work finding distribution to travel off the island, one woman is writing her chapter in the movement. A novelist of two acclaimed works, Julia Leigh has already found her way into Cannes with an original film of sexual desire—Sleeping Beauty. And while the buzz is high, another film sporting her name in the credits deserves just as much notice. Directed by Daniel Nettheim from a screenplay by Alice Addison, Leigh’s source material for The Hunter comes to life through the quietly terrifying Tazmanian expanse. 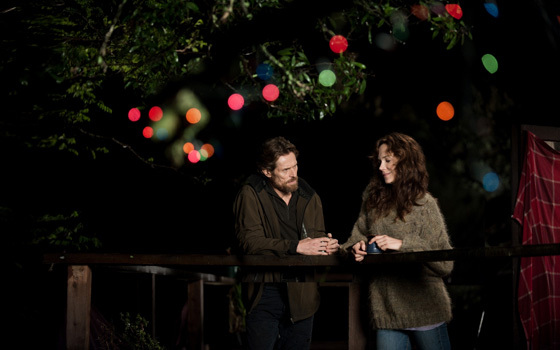 A story full of intrigue, its seemingly minimal plot finds a way to expand its scope tenfold as unsolved mysteries come into focus for antihero Martin David (Willem Dafoe)—the forest sucking him into a dark world controlled by dangerous people. David is a loner. It’s an ideal trait for his line of work, helping to keep his professional interactions on track without distraction. His abrasive personality caters him to the task at hand, his confident strength proving to the Red Leaf representative that hired him there will be no problems. More a poacher than the ambiguous title of hunter hints, David is an experienced trapper for whatever game enters his sights. Refusing assistance and cagey to a fault, the American willingly and without hesitation agrees to travel to Tasmania for a top-secret mission that may prove to be nothing but a wild goose chase. With just two sightings in a year, what was thought extinct—the Tasmanian tiger—has been rediscovered as more than fantasy. But like any exotic beast, it’s own survival is mere afterthought when dealing with corporations and political entities with means. Believed to hold a key towards new defense weaponry, David has been enlisted to extricate it quietly from the island and into his employer’s hands. Orchestrated to suit his personality, his lodgings are a secluded home just outside the entrance to the rocky mouth of the unknown. On paper it is the perfect space devoid of distraction with the man of the house—Jarrah Armstrong—missing since the previous summer, his wife Lucy depressed and comatose on pills in bed, and the two precocious children just annoying and needy enough for David to keep his distance and do his job. A local named Jack Mindy (Sam Neill) has made all the arrangements thinking this visitor to be a university professor researching the Tazmanian devil population. He comes by now and then to check on the Armstrong family while massaging their guest’s obvious frustration from a lack of electricity and the ceaseless meddling of kids. But David isn’t one for small talk, closing his door to the children and refusing the help of Mindy to tread the wild alone. Very purposeful in its dissemination of details, The Hunter is a slow moving piece that allows the layers of both the discrete mission and standoffish lead to peel away at precise speed. David’s employers know he has the skill set to create results, so they give him the space and time to do what needs to be done. With only a couple of months before news of the tiger leaks publicly, they must act swiftly before the whole world enters the hunt. But through the long days isolated in the woods, David begins to wonder about his prey. Possibly the last of its species, hunting and surviving as it waits to join its fallen kin unafraid of death, the tiger isn’t much different than the man chasing it. Knowing his own fate could mirror that of Jarrah, David’s survival becomes as tenuous as any other creature walking the earth. Staying within a logging town bent on keeping the workflow necessary to sustain family living, the locals lump David in with their ‘enemy’—foreigners on missions to save the environment. With his cover being a collegiate nature expert, it doesn’t help he’s staying at the home of a man who fought to keep the forests unharmed. Jarrah wasn’t well liked and since he was never found, foul play hasn’t quite been dismissed. David must watch his back, making him question the kids for any knowledge that may be of use. These interactions end up uncovering their unfortunate situation, though, bringing his lone wolf closer to humanity and the realization they might hold the answers he needs. So, he helps Lucy (Frances O’Connor) sober up from the depths of depression, defaults into a role as the new man of the house, and watches as the traumatically-mute boy’s drawings transform into maps shedding light on a massive conspiracy and the precarious state of their safety. Tonally dark and clouded by the mystery of Jarrah’s disappearance, the plot quickly becomes much more than a man’s search for fantastical creatures. Dafoe brilliantly moves between formidable force and compassionate savior, O’Connor and the fantastically raw performances from Morgana Davies and Finn Woodlock (Sass and Bike Armstrong, respectively) thawing him as they risk derailing what it was he came to accomplish. Red Leaf remains an ominous presence at his back with every step; Neill’s conflicted Mindy hovers, his motivations never completely genuine; and the loggers constantly threaten to push David over the edge. The Armstrongs help keep his focus straight and give him a reason to live that the tiger he hunts no longer has. His amoral neglect for life becomes unacceptable, his bond to this family growing too deep to move on without looking back. 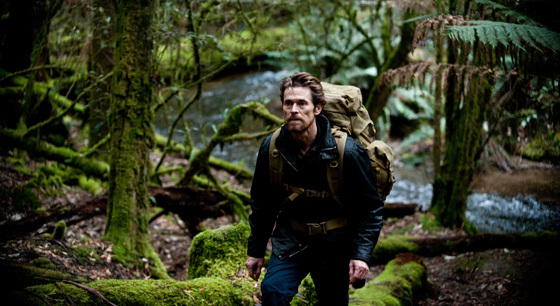 The Hunter exists inside the softening eyes of Dafoe as Nettheim never strays from showcasing his star. With many passages devoid of speech, we enter the forest with Martin David and watch him grow emotionally. The answers to his search are hidden with the children and by letting them in he moves closer to its completion. It isn’t long before the hunter becomes the hunted, though, as right and wrong begin to blur. David’s job to capture a myth turns into a rescue mission for a vanished man before ultimately transforming into a quest for salvation. The journey is difficult and the consequences of his arrival are gravely felt as the story chooses truth over an audience’s desire for hope. There is a reason someone in his line of work detaches from civility and relinquishes all human connection. Hunters can’t help but bring death along on their journey, the victims of its unforgiving nature never necessarily the ones who deserve it. 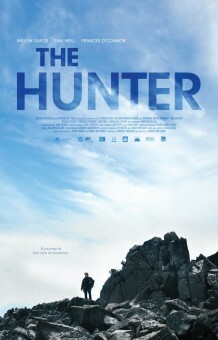 The Hunter hits limited theaters on April 6th and now on VOD.